Reflections and Ruminations: When we are angry with God, he isn’t offended. When we are angry with God, he isn’t offended. I hear this confessed as a sin with such regularity that it prompted me to reflect on this in my weekly blog. "Father, I am angry with God." It seems to plague many sincere hearts who come regularly to the sacrament of reconciliation and as much as possible, when time allows, I try to unravel what appears to be a knot that is featured in the lives of many of the faithful. To be sure, there are many Catholics who have not been sufficiently formed well, for various reasons, and their images of God in their mind are often stuck in their pre-confirmation, early teenage years, and because they hardly made much efforts in learning more about their faith after their confirmation, many have grown up into adulthood and at ages of 50 or 70 years old, carry with them a very stilted notion of God, and one which isn’t very helpful to having a real and loving relationship with in the spiritual life. That God is imaged as a divine control freak who gets all upset and wound up and becomes stuck in an emotional snit of sorts isn’t very helpful when words from Scripture, Apostolic Exhortations and preaching at Mass tells us that God is merciful and slow to anger. The fact is that this image of God may have been useful in bringing across the fact that we need to be respectful of God and mind our p’s and q’s in our moral behavior when we were in our pre-teen years. And I use the phrase ‘may have been’ very cautiously, because oftentimes, what we hear as impressionable children later becomes impregnated into our developing psyches with a resistance towards change and getting over, not unlike the way an earworm gets into one’s head and nothing seems to get it out without being drowned out by an earworm that is more annoying that the first earworm. I have come to the conclusion that as a priest, I will probably have to spend the rest of my priestly life having these conversations with penitents who hardly realize that it is their stilted notions of a small and petty God that has caused them much strife in their spiritual journey toward maturity and freedom. I have always harboured the hope that I could do this en masse, where I could with one good teaching session, or one catechetical event, or one well-written blog or essay, somehow change bad theology and somehow have the people of God suddenly see light when they had been in darkness all along. I have realized that this is indeed too facile a belief. I have to remind myself about the law of gradualness, something that is taught in moral theology, which is a notion that people improve in their relationship with God and grow in virtue gradually, and hardly ever make a great leap of improvement overnight. I need to remind myself that it takes great humility (and great love) to even want to change our often stubborn ways of thinking. Pride may invade our hearts in one fell swoop and take up some form of permanent residence there, but humility is always only given a small space in that same place, and most often as an invited guest and hardly given all the rooms inside the same heart. In that same way, a toxic notion of God can only be changed if one wants to give space for a healthier understanding of God. By the same token, I look upon with great pity and empathy in my heart whenever I encounter penitents who struggle with habitual sins and in their prayer, are asking God to control their desires and habits. Hardly do they realize that what they want is a God who is massive control freak who doesn’t want or value the freedom of his creation. It is precisely because God isn’t interested at all in controlling us that he gives us the freedom to curtail our habits on our own, out of love for him. Any actions done by us because we are not free to do otherwise diminishes the purity of our love for God. A gossiper who doesn’t bother to control his or her tongue but is only asking God to clip his or her speech has failed to see how much value it is when one makes all the effort one can to curtail the things one says, and the characters whom he assassinates with his loose tongue. Scripture tells us, and tells us correctly, that the fear of God is the beginning of wisdom. Unfortunately, Scripture doesn’t have footnotes to define what this fear of God looks like in life. It doesn’t give an indication that this fear can be one that is healthy and how it can also end up being unhealthy. 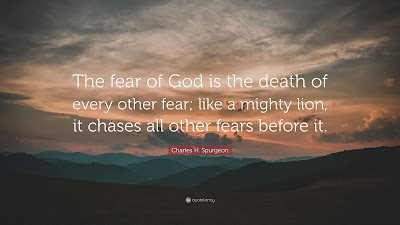 And unhealthy fear is manifested when one thinks of God as a fierce ogre who is lurking around the corner, who overhears our every conversation and spies on us waiting to catch us committing sins. That is a fear that is far from a healthy one. A healthy fear is one that is based on giving such great deference to God and his love, that one fears breaking or injuring this love and wants to do all one can to maintain the integrity of this love. This is the fear a husband has of his wife, and the wife for her husband. Not a servile love, but one that fully understands just how beautiful and precious the love is that one has been given, and one fears bringing any harm to this love through neglect, ingratitude or carelessness. A fundamentalist once asked psychiatrist Fritz Perls if he has been saved (as many fundamentalists are wont to do), and he had a classic answer: Saved? I’m still trying to figure out how to be spent!” Perls understood rightly that when one fully appreciates the depth of the meaning to be saved (which is the same as appreciating being loved), one ought to be fully aware of the need to become just as loving to everyone, everywhere and every time. This is the joyful energy that needs to be generated outward, and to be generative of one’s own ability to love. Fear of God.. that was your advice to me in a confessional booth a year ago. It worked. No more craving after 30years ofsmoking. A teacher of the faith that I greatly respect likes to remind me that our vocation in life is to find holiness or personal sanctity….and it has left me (sometimes) with the vexing question - whether that is really possible in a world that is increasingly hostile to religion.But he retorts with - “yes,…through the primacy of grace .” No ‘good’ Catholic can argue with that ! Similarly, when I reflect on this - “ being angry with God “…… I wondered if one is really mad with God or is it because one is actually angry with self? Feeling the tension, the frustration with and within self because one is expected to live in a radical way, the way of Christ. ………a way that is counter to mainstream culture in the society that one finds oneself in. So, will this follower, this Christian - ultimately be like the rich young man - walking sadly away because he could live the Commandments but could not live the Law of Love that demands a detachment … a dying to self, a sacrificial love -of loving other as other? Or be content to be a “tepid” Christian? negotiate his way through this scenario. In his in-most being he believes all that the faith has taught him to be true and yet there is no GPS, no road map to show him how to be “in the world and yet not of the world”; how living on the margins of society he can still try to be salt of the earth and light of the world. Made inarticulate by such a load, perhaps its is more simplistic to say - “I’m angry with God,” and then feel guilty because he knows it’s not the Almighty’s fault. Thank you Fr. I also agree that He is not offended but rather pleased that in this topsy-turvy world, His children make the effort to question so as to learn to live and love in a more meaningful, if not deeper way.